Last night, I was reading an old Weavers magazine article about using a reed to widen tablet-woven bands, and it made me recall reading in Peter Collingwood’s tablet-weaving book about tablet band widths being determined by how the weaving was beaten. The pattern still isn’t what I was expecting, but the background is a lot prettier, and the cloth is softer and easier to beat. Now, if only I can figure out how to make the front look as nice. 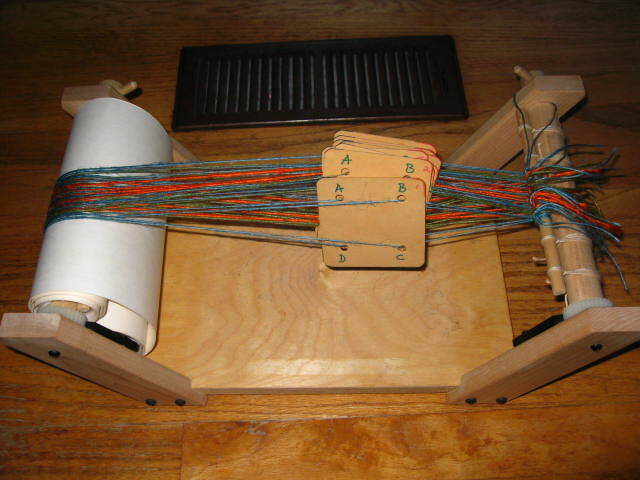 I recently came across a Howell tablet loom that had never been used. 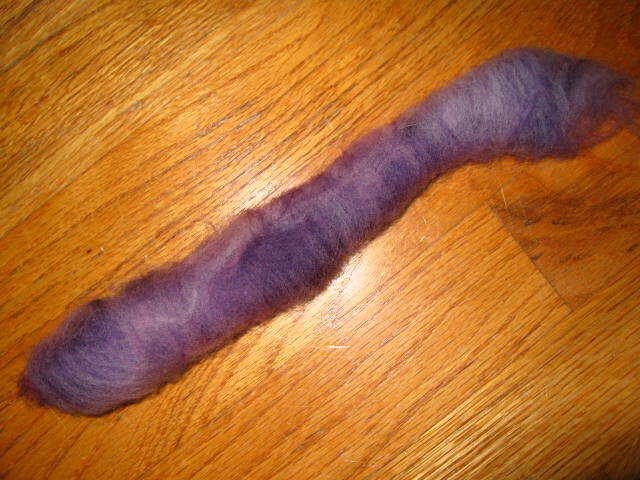 The interesting thing is, another weaver on Ravelry was given an older model at about the same time. I haven’t figured out how to use this loom the most efficiently yet, but we’re comparing notes, prompting this post. 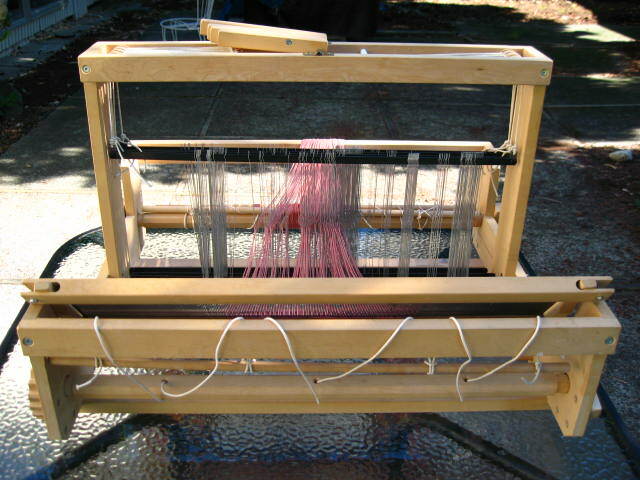 The Howell tablet loom is just over 31″ long at its most extended, and 11.5″ at its widest. 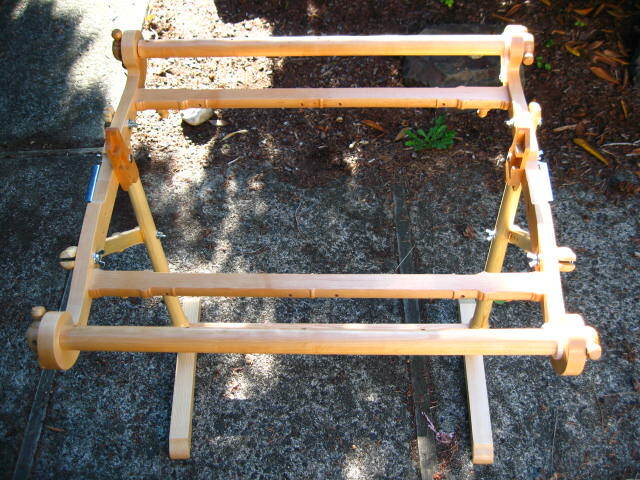 In the picture below, my warp is obscuring the extension wood piece between the two ends; this wood beam has four holes drilled through along its length so you can choose how far apart to set the two ends. Being only four holes, these are for setting the distance that you want the ends apart; they won’t help for warp take-up. Turning the loom over, you can see rivets set into the holes to hold the screws. The picture below shows the screw bolting the wood from the bottom up. The loom actually came with the screw put in from the topside down. 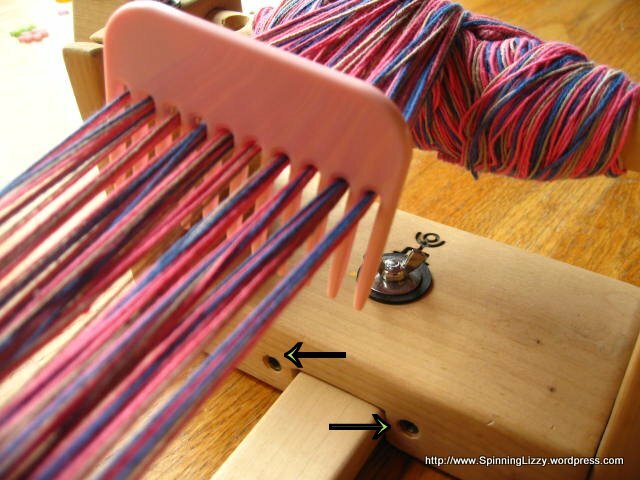 I wanted to be able to take apart the loom faster, so I changed the direction, and purchased a wingnut and washer (and an extra rubber washer beneath the metal one, to protect the wood), to hold it from the top. 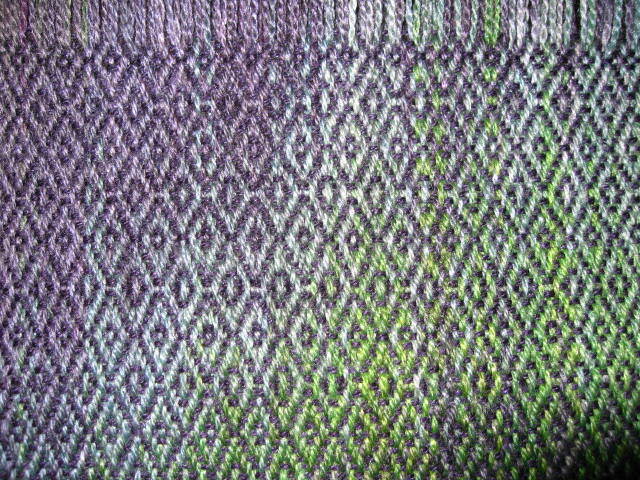 The warp is cotton rug warp; the pattern I’m using is a 3-colour double-faced one from Guntram’s Tabletweaving Page. 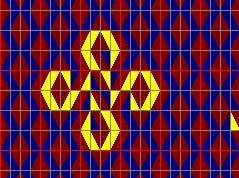 It took me a few hours to figure out the details on how to weave double face, as I couldn’t understand the weaving and turning descriptions from several books. The answer came from reading Peter Collingwood’s book on tabletweaving, an extremely comprehensive resource, and a worthwhile addition to any weaving library. Guntram’s site is amazing, and he even wrote a (free!) application, GTT, for designing patterns. 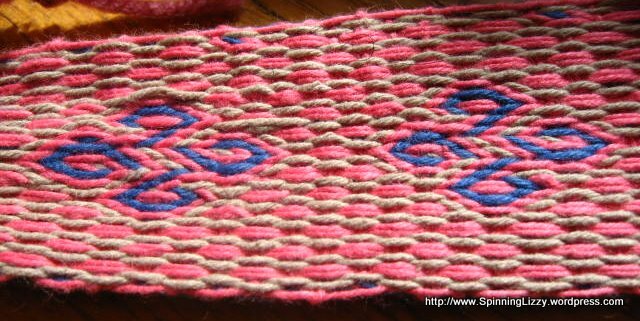 Perhaps it’s the colours I chose (pink instead of red), and the fact that I didn’t want to beat until my hands hurt, but my weaving doesn’t resemble the pattern much. 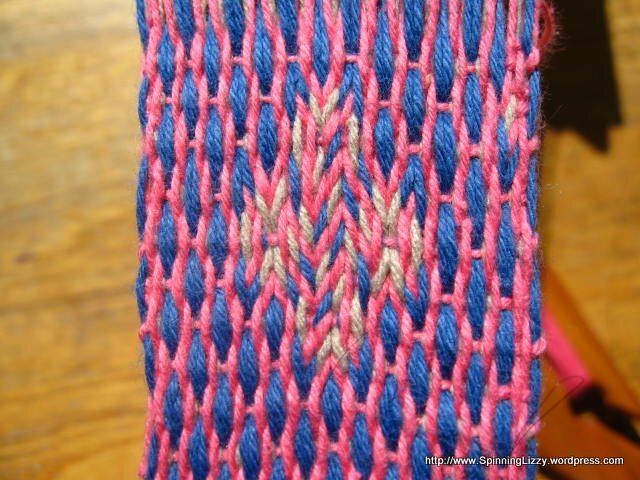 (My weaving is rotated 90-degrees from the pattern sample above.) I already beat and packed the weft down hard; if I had to put any more energy into doing this, it would no longer be enjoyable. 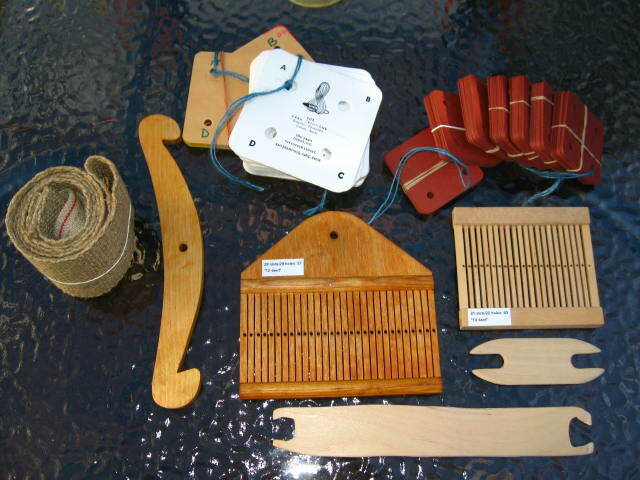 I purchased this loom without having seen it in person, even though I could find no information about it, all because the few Howell tools I already had (including the beater seen in these pictures) are so beautiful, and I like the little man log burned into the wood. 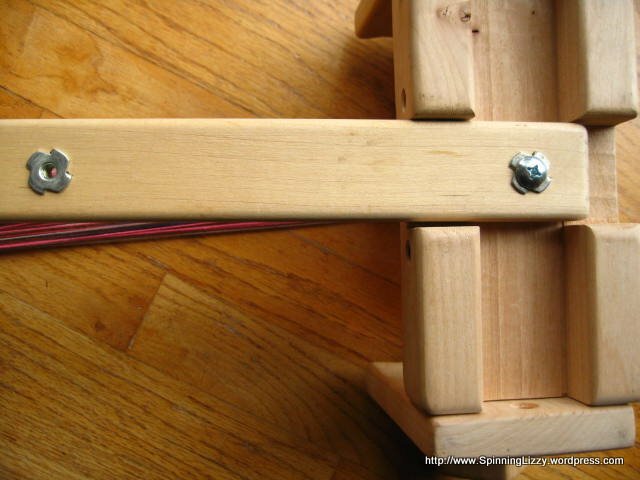 It seems odd to me that this loom should have only one dowel, but that’s the way it came originally. I’m enjoying solving the mystery of what the parts were designed for and how they were meant to be used. 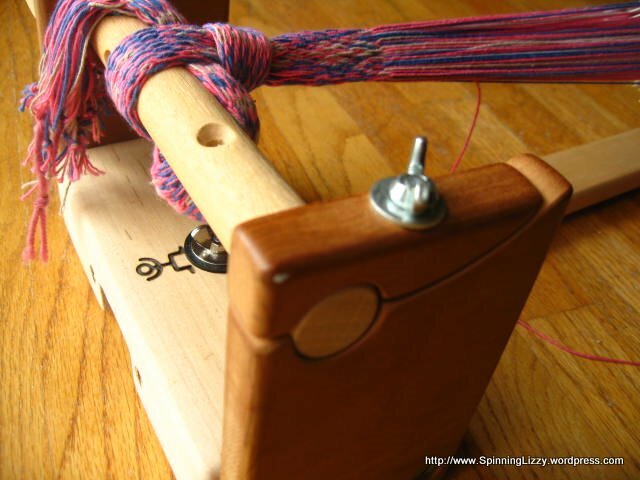 After puzzling about it, it seems to me that it would make most sense used to use the dowel to beam the warp threads. The simple winding mechanism holds tension very well. 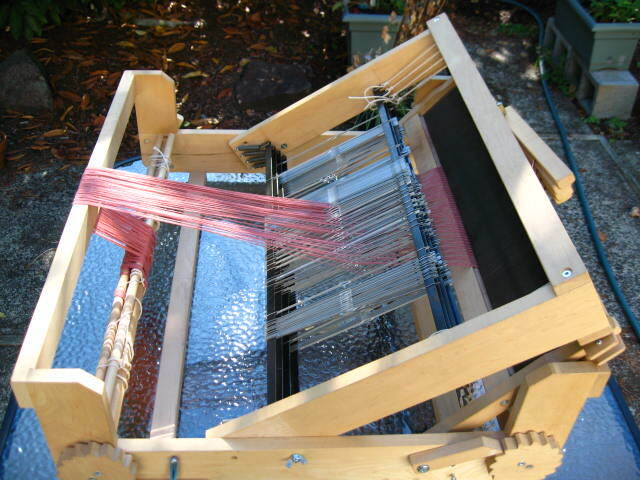 I originally beamed on the warp (close to four yards) without warp separators, (as shown below), but what a mess it was! 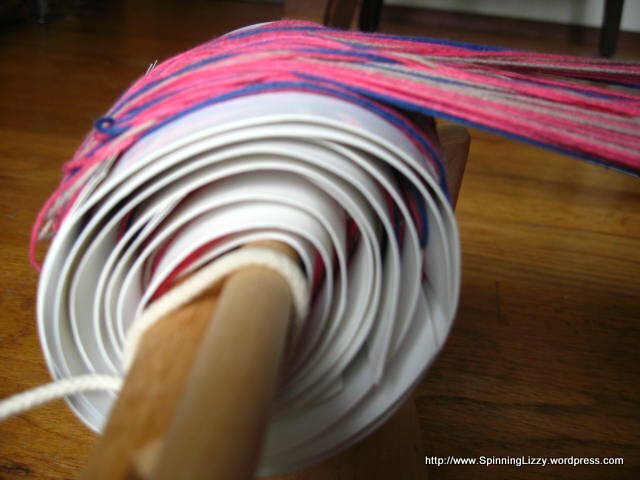 By the time I decided to try re-winding the warp with separators, I couldn’t get the warp wound on evenly. I added a comb (plastic hair comb) to act as a warp separator; it helps the tablets turn more easily. There are holes drilled into the base, on both sides of the slot where the adjustable wood beam would slide (see the arrows in the pictures below). Two additional holes are similarly drilled into the other side of the wood base. The holes have been fitted with metal threaded nuts/inserts, to accept a screw or bolt. 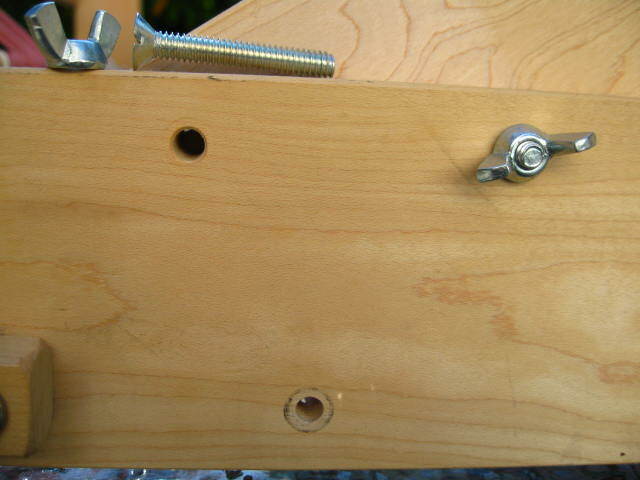 The screws used to bolt the wood base ends to the long beam fit into these holes on the the sides of the bases. I have no idea why these holes were put in. After using a comb to help with separating the threads, I could see that a larger, permanent warp separator would be very useful, and perhaps the holes could be used to bolt it into place. Why did Howell go through the trouble of inserting nuts into the holes? I would love the mysteries of this loom solved! 1. 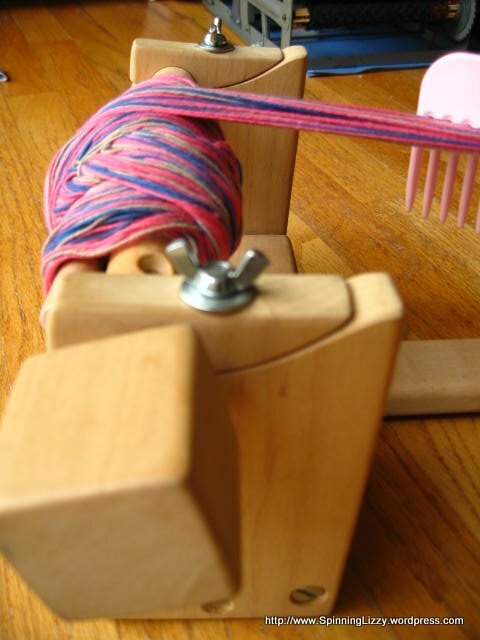 What is the best way to dress this loom (especially with long warps), and maximise the tension on the warp? 2. Is there a better way to tie the cloth band onto the front beam? 3. Why is only one dowel included, and how is it meant to be used? 4. The two base end pieces wobble slightly on the wood beam, even when tightly screwed on. It’s not the huge detriment to this type of weaving that it would be to others. Is there any way to overcome this, or is it just something to ignore? 5. What are the mystery holes on the base meant for, and why put them on both sides of each base? 6. 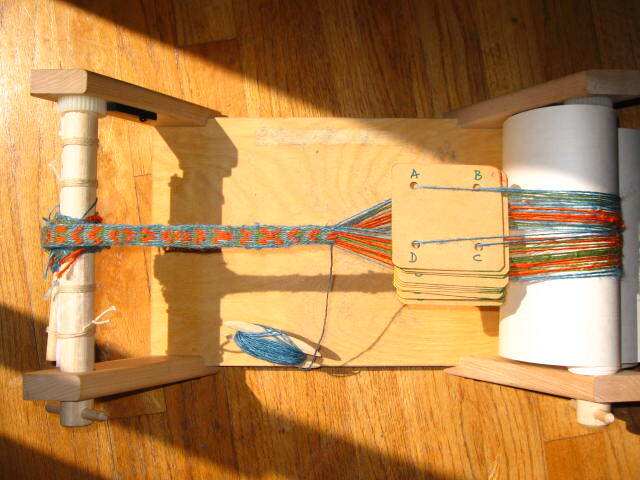 I’ve heard rumour of video put out by Howell on tablet weaving… anyone have one they’d like to sell to me? If anyone knows anything about using this loom, any information and comments are both encouraged and appreciated! Last year, around September, it was on, then off. After a long wait, I was suprised to hear it would be on again; then a couple weeks later,(due to heavy rains), off again. Due to scheduling, it probably wouldn’t be on again until after February. Then, at the last minute, I hear it’s really on again. Tomorrow. I’m speaking of the weaving class to be taught by Syne Mitchell. Over the past couple of days, I’ve been frantically preparing my portable loom for a double weave project. 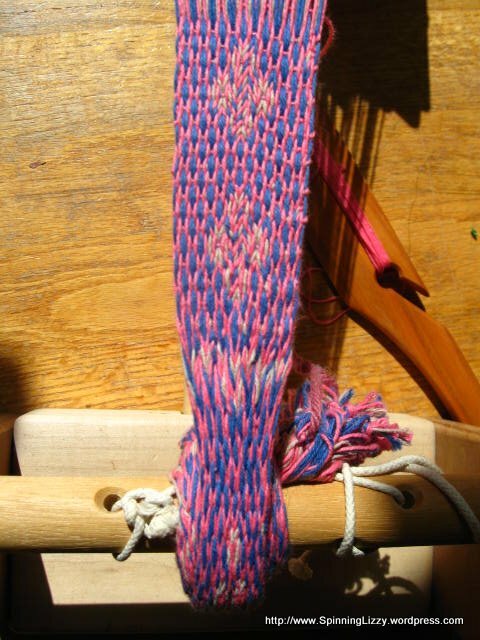 I also tablet-wove a strap to make it easier to tote the loom. 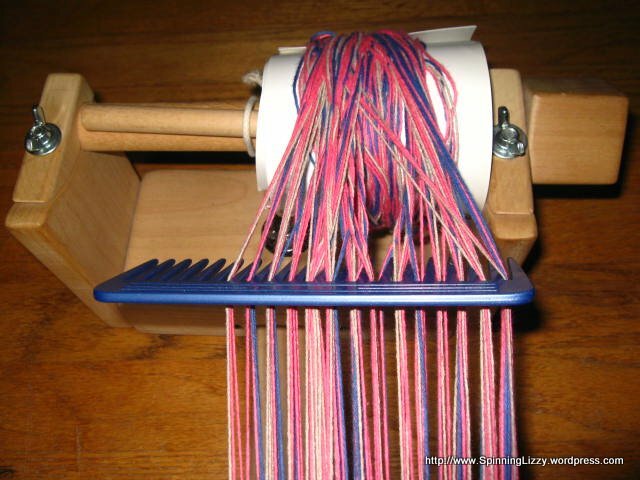 Finally, I warped my Harrisville Designs Easy Weaver “B” loom (first-time warped) with Lion Brand Fisherman’s Wool. If there’s time, I want to do some pick up from plain weave for a shibori design. 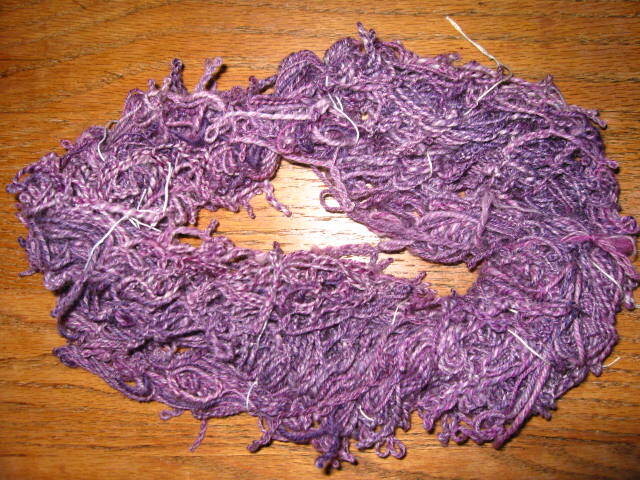 I plan to dye the scarf in different colours, then overdye after pleating the fabric for the shibori effect. Class starts in less than 12 hours. Wish me luck? I was weaving on my Easy Weaver (size A, small), a rigid heddle loom made by Harrisville Designs. These come pre-warped by the manufacturer, using the ingenious method of attaching velcro on both front and back beams to quickly warp the loom. 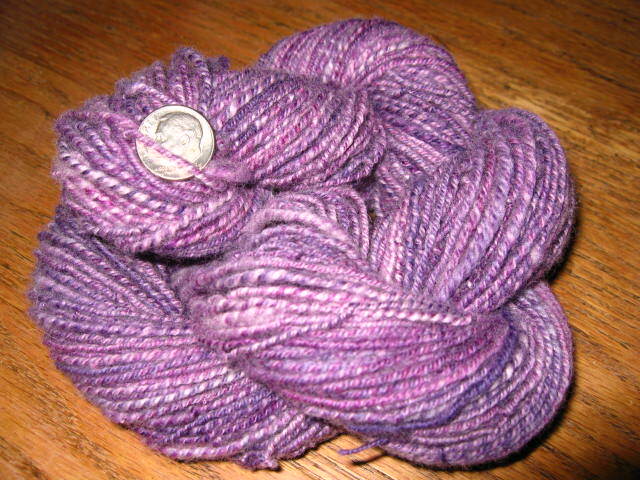 Mine was used, and two-thirds of the warp was already woven. I impatiently finished off the last part (letting my son weave a few picks) so I could tie on a warp I prepared for my first try at tablet (or card) weaving. 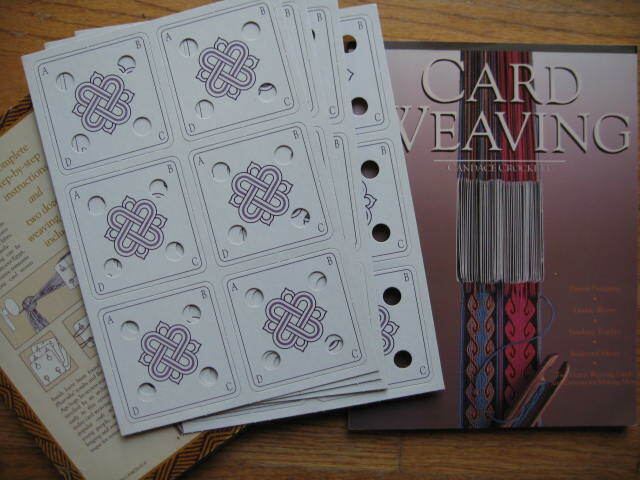 Before the BBQ, I quickly tied on that first card-weaving project, “Sample Band A” from Candace Crockett’s “Card Weaving” book. I started the first picks in the car. It caught the interest of one of my nephews (a belt), so I’m already received my first commission! I’m very happy with this sweet little loom. It does exactly what I wanted it for, weaving in the car. (The passenger seat, silly. I can already “weave” when I’m in the driver’s seat!) It was inexpensive, since it was used and missing one shuttle. 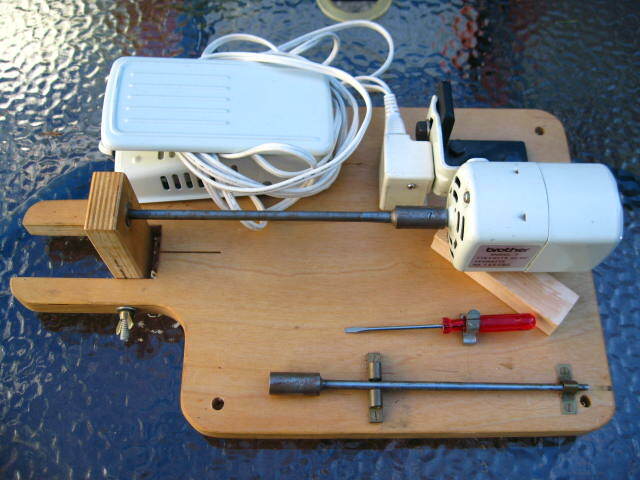 It’s the older model, so there’s no heddle block mounted on the base to interfere with tablets. And it is perfect for my son to use if he wants. 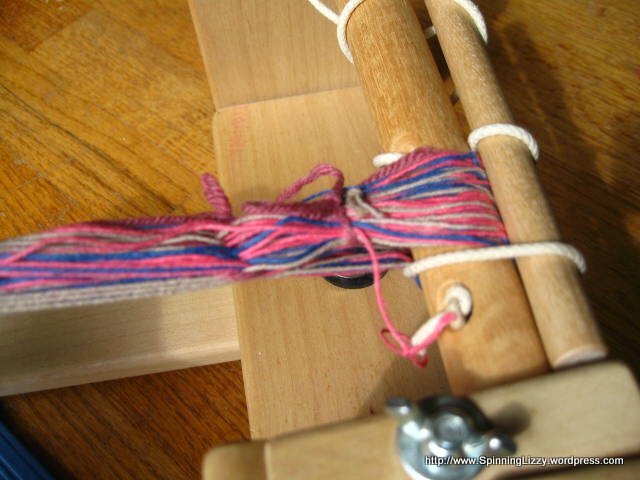 I had a little difficulty getting the warp tight enough with my tablet weaving, since the apron rods I added on tended to slip and loosen the warp and cloth; I will try drilling holes through the rods (for the cording) to see if that will keep them from turning. I finished off the belt (it’s horrible, made of jute, with lots of mis-turnings) and beamed on a second during a four-hour road trip to Vancouver, BC. Alas, I ignored the advice to avoid using jute in a first project, for it proved finicky to handle as well as too rough and bulky for belts; they might be salvaged as luggage straps. It was cheap because the motor was Danish and made for 220v electrical; I took it into a repair shop, where I was fortunate to find a used 110v motor to replace the original. The day after the Easy Weaver arrived in the mail, I was practically gifted this 24″ Kromski Harp, with stand, by someone who ordered it new but never got around to taking it out of the box. I don’t know if I’ll keep the Kromski. Somehow, I just can’t love it as I do Hedy (Schacht), even though the Kromski has a larger weaving width and can accept two heddles, whereas Hedy is limited to one. I’ve been dragging my heels on the very last bit of the assembly, tying on the apron strings and rods — some bother about finding a candle to melt some nylon ends together. The ornate woodworking of the Kromski just doesn’t move me as do the quiet, square lines of the Schacht. Also, I’ve received a few offers for it already, so I may not have it long. I will add a later post with pictures to compare these two looms..
Last, I came across this handsome fellow, a 25″ Rasmussen table loom that had been stored for thirty years in perfect condition. I think I tried removing the screw on the upper right (instead of the bottom one), and found it doesn’t work, either. Or perhaps it didn’t make sense to me, since the castle would have to tilt away from and not lock down the reed, and would not collapse as compactly. I’ll try calling Montana Looms, the company now manufacturing these. 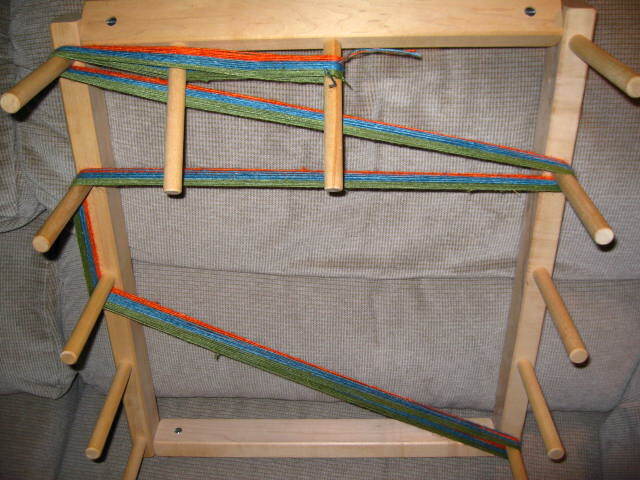 Gil’s collapsing feature isn’t quick or easy compared to my other table loom (Bergman Treasures And A Reprieve), plus he is bulkier and heavier. It’s more likely that I’ll end up taking out the booster seat and putting down the back seat of the car rather than collapse this loom again. In compensation for spending practically zilch on looms, I have been bankrupting myself on books –Peggy Osterkamp’s second and third, and “Mastering Weave Structures” by Sharon Alderman — plus accessories. 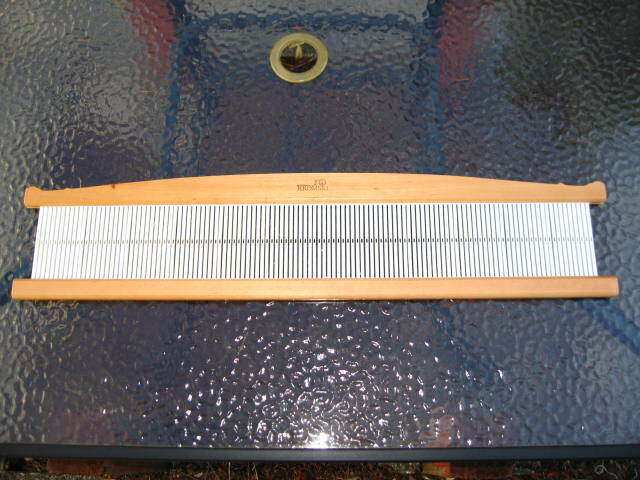 I purchased two hundred new metal heddles for Gil (more expensive than the loom), to bring him to five hundred. And placed an order for a Schacht auto-reed hook (shockingly expensive) that I can’t wait to use. I think I’ve just made the argument that weaving cannot be be inexpensive, if one values time. Reading through the used weaving books recently acquired, I’ve found names written inside, and small notes. Most of the used books are circa 1970’s, with pictures of authors usually in their 30’s or later. Why are so many weaving texts out of print, where are these people now, are they still weaving, and did they fulfill their dreams? I muse on these things, and when looking at the authors, realise that many of these women may already have passed. At least four of my looms are older than I, and with care may probably last longer. Perhaps it’s silly, but I’m wistful, at the thought that my time to use each of these looms is running out. There will be some point when I too must pass them on to the next weaver. How can I possibly weave enough when dressing one loom has taken me more than twenty-four hours?! 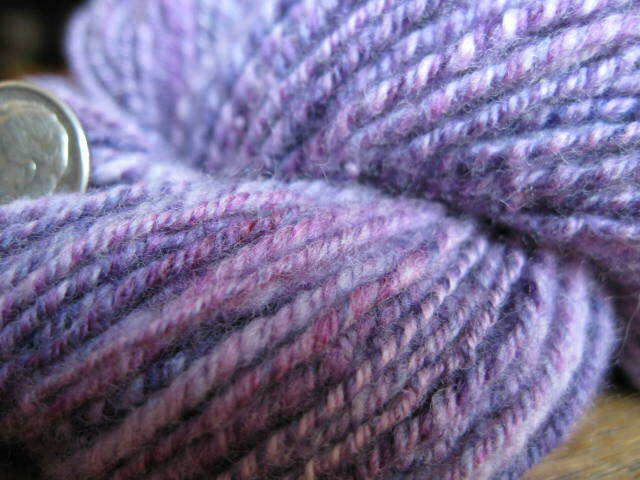 My slowness at knitting never bothered me. 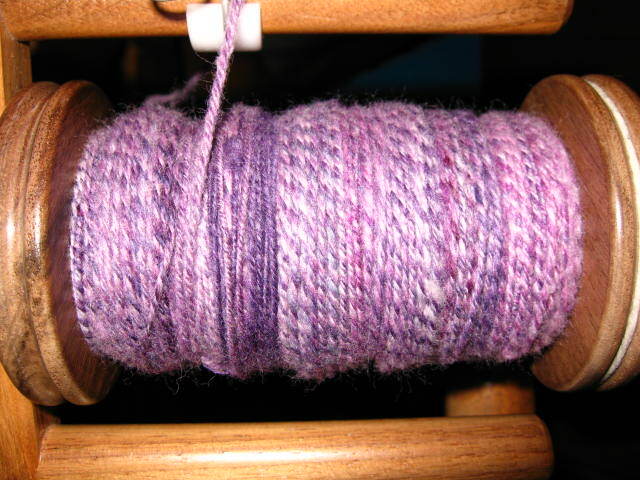 I’m not slow at spinning; but I suppose recently I am, since I’m never spinning, but always weaving warping. I touch these older looms, read these older books, and I see my life dwindling down and I wonder why I am doing this, what am I accomplishing, is this adding meaning to my life, will my family survive this, should I stop before I’m in trouble, and why do I enjoy this? Because, I truly don’t need another scarf.